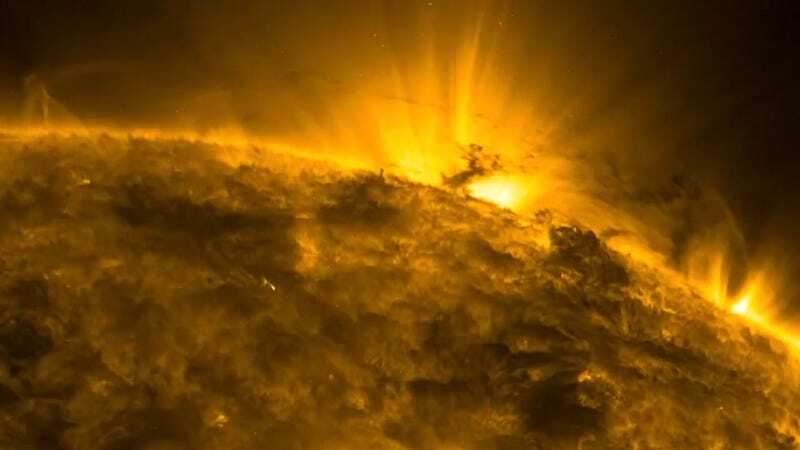 To be launched into the sun, you need to have enough energy to escape Earth's gravity and enough energy to overcome the Earth's orbital velocity around the sun. Escaping the Earth from the surface requires 11.2 kilometers per second and falling into the sun requires about 29 kilometers per seconds. These add together in quadrature to get 31 kilometers per second of total delta-v.
To launch a person with a mass of 70 kilograms from Earth into the sun without any protective gear (I assume you don't value their survival if you're launching them into the sun), it requires a minimum of kinetic energy of 33.6 gigajoules, or the equivalent of about 8 tons of TNT. By comparison, a 16-inch naval gun can launch a 1,225 kilograms projectile to a speed of 762 meters per second, giving it 359 megajoules, or the equivalent of 85 kilograms of TNT. You need at least about 100 times the muzzle energy of a 16-inch gun to launch a person into the sun. The Schwerer Gustav, the most powerful gun ever built, could launch a 7200 kg projectile to a speed of 720 meters per second, still giving it a kinetic energy equal to barely half a ton of TNT. The Gustav had a mass of 1350 tons while the 16-inch gun has a mass of 121 tons. I don't know what scaling law guns follow, but I can safely guess that such a gun would be at least a few times as massive as the Gustav gun. A mildly relevant comparison could be made with the Saturn V rocket, which had a fueled mass of 2300 tons. So now let's suppose we build a cannon with a muzzle velocity of 31 kilometers per s. What would happen? Well, if the barrel of the cannon is less than 100 meters long, the acceleration experienced would be on the order of 500,000 g. For a 70 kilogram person with a cross sectional area of about one square meter, the stresses imposed would be comparable to burying the person under a mountain. As a consequence of Newton's third law, the gun feels the same force as the person, and has to deal with those immense stresses somehow. Once the person makes it through the barrel, they'll be immediately greeted by Earth's atmosphere at Mach 90. The acceleration from the resulting drag would be comparable to the acceleration felt while coming out of the cannon, but in the opposite direction. The thermal loading would heat the air ahead of the person to tens or possibly hundreds of thousands of Kelvin. So, in summary, you've embarked on one of the largest engineering projects in history and found a way to pulverize and incinerate a human being in less than three thousanths of a second. Are you sure you still want to fly them into the sun, where the surface temperature is a mere 5800 Kelvin? Yes? Okay, let's make the launch survivable. We could make the cannon a rail thousands of kilometers long that gradually slopes into space, but you have to consider that such a rail would have to curve around the Earth. A body in circular motion at 31 kilometers per second around the Earth experiences 15 g's of radial acceleration, which would easily kill a person. How about a space elevator extending 36,000 kilometers above the equator? The average vertical acceleration would be about 1.5 g's, which includes the force of gravity as it decreases with altitude. This is managable. Interestingly enough, because the space elevator is necessarily on the equator, it won't always point in the direction opposite the Earth's velocity relative to the sun. You have to wait for the Earth's velocity vector to pass through the vernal equinox, meaning that such a launch can only be performed during two periods a year around the solstices. Otherwise, you will waste energy moving your projectile out of the plane of the Earth's orbit and you might not reach the sun. Finally, once you've overcome the problem of keeping your payload alive until after launch, they will fall to the sun for about 9 weeks (Kepler's third law, a = 0.5 au). Even if you supplied him or her with oxygen and food to last that long, they will probably die from radiation exposure or their spacecraft overheating in the gradually intensifying sunlight long before reaching the sun's photosphere. In other words, yep, you can definitely probably launch someone into the sun. They'll just be dead by the time they get there. Is it possible to build a cannon that could launch a person into the Sun, and how big would it have to be? originally appeared on Quora. You can follow Quora on Twitter, Facebook, and Google+.